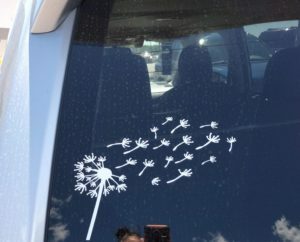 Once I start noticing a thing, like the white stickers on car windows, I start seeing them everywhere. Of course the very best ones that I glimpse are the ones I see as I am driving along. And it would be impossible to pull my phone out of my pocket (the seatbelt holds me securely in place) and snap a picture before the traffic light changes. Oh well, sometimes these things are just meant to elude one’s grasp. But I did manage to capture these images on parked cars. 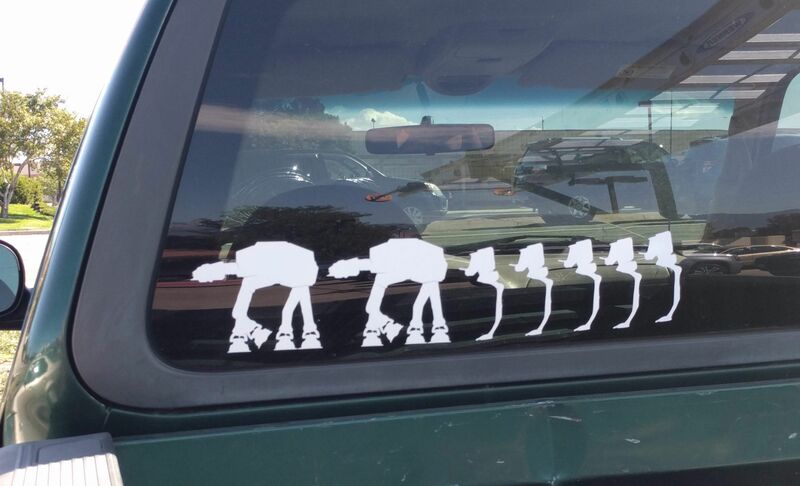 In lieu of stick figures, Star Wars seems to be the next most popular way to graphically illustrate one’s family. 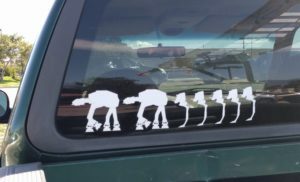 I have seen Darth Vader as paterfamilias, various storm troopers, and this one, with the large war machines, At-At’s, for the parents and the smaller war machines, At-St’s to show the number of kids. Must be some sort of fan, eh? 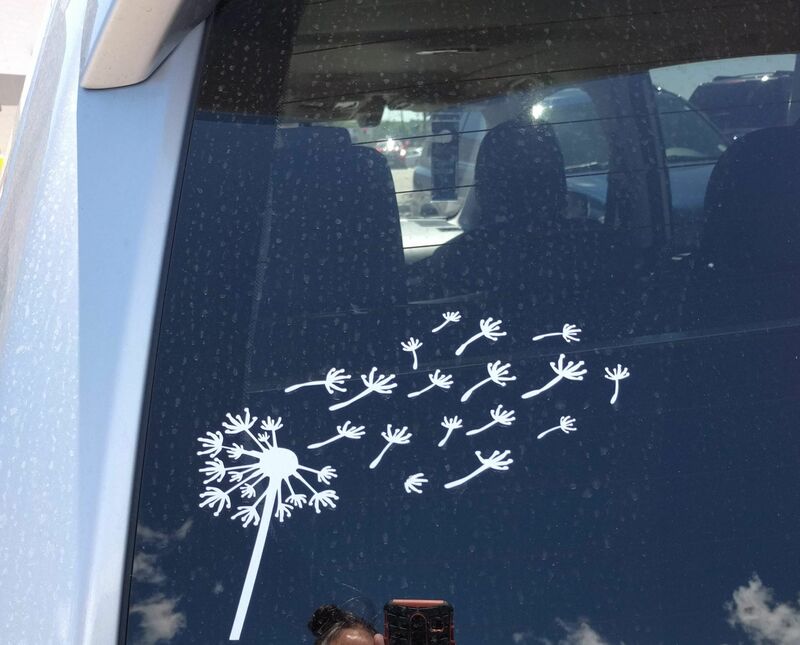 I loved this sticker from the moment I saw them pull into the parking space. The combination of the cheerful yellow truck and the image of the elephant, it was really quite striking. (Although they probably don’t have a pet elephant waiting at home). 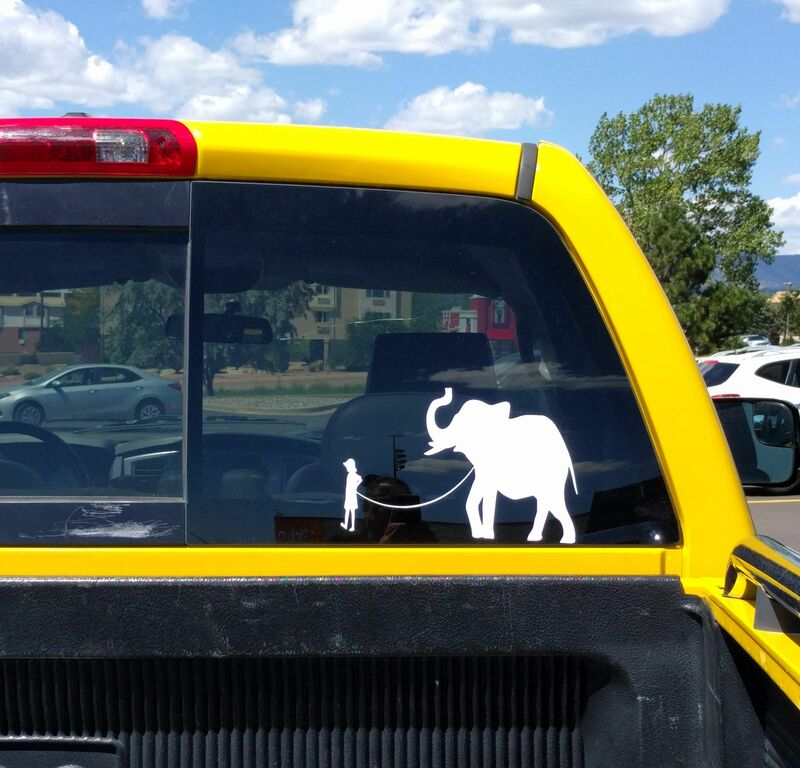 I saw this one in the same parking lot as the elephant, and I somehow don’t think that it has an ulterior meaning, it was just a pretty thing. 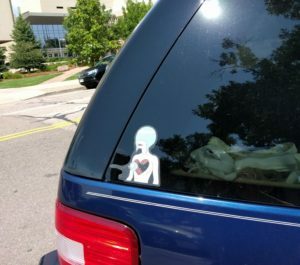 And then there is this creepy sticker. It’s on a rather nice SUV, but this girl wants everyone to know that she is a scary person at heart. So we have seen these people’s obsessions, and you see my obsession, taking a peak into their souls.